Today a set of specifications has leaked giving the dimensions of the next big iPhone. This iPhone 8, as it’s being called, could also be referred to as iPhone OLED, iPhone Pro, or iPhone Edition – whatever you want, since no real confirmation of its existence has been made by Apple as of yet. What we’ve got today, thanks to these dimensions, is the ability to compare this generation’s iPhone to the next. Apple’s next major smartphone will have a size somewhere in-between the iPhone 7 and the iPhone 7 Plus. 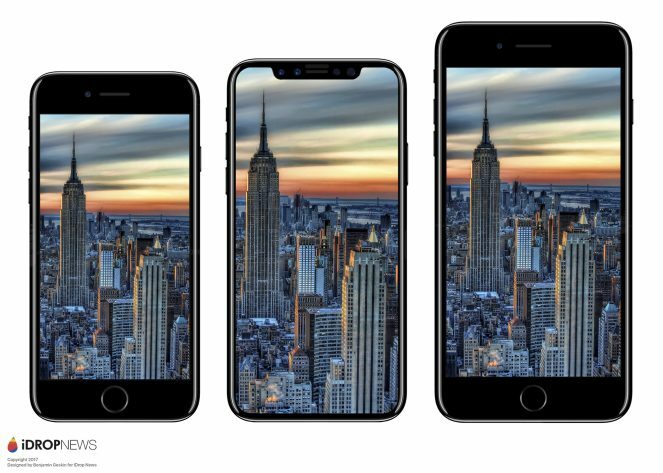 Instead of matching the iPhone 7 Plus, as was once assumed, this new iPhone 8 is pictured here right in the middle of Apple’s current two iPhone models. As such, the image you’re seeing above might well also be a close depiction of the iPhone 7s, the iPhone OLED Pro Edition 8, and the iPhone 7s Plus. Of course the jury is still out on what the most powerful of these three devices will be called, but there’s a good chance it won’t have a name as long as what this paragraph presents.